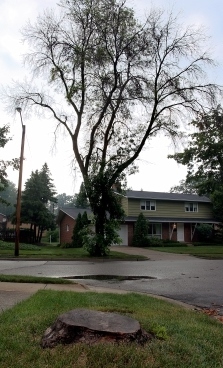 The decision to protect ash trees from EAB infestation, or attempts to preserve an already infested tree may be influenced by several factors including location, cost, likelihood of success, and the benefits provided by tree. Preservation efforts can be guided by several factors, however the weight given to each will depend on the site, preservation objectives and other considerations. Treatment cost and benefits should be evaluated against other management options. In general, once started treatment may be required indefinitely while significant EAB populations are present and continue until area wide insect eradication has been declared. Hazard Potential - Trees whose decline may pose a hazard to individuals, structures or other high valued sites are likely not suitable preservation candidates. Tree Health - Treatment of trees already in decline, showing signs of stress or exhibiting signs of EAB infestation should be considered carefully as it may be more expensive and less likely to succeed. Current research indicates that success rates are lower in trees with more than 30% crown dieback. Size - Medium sized and large trees often provide more benefits than small trees and are more costly to remove. However, treatment costs may be lower for smaller trees. Removal Cost - Removal costs are affected by tree size, form, location, access, equipment required, and processing & debris removal requirements. Replacement Cost - Where tree replacement is desired, replacement costs should be included in option evaluation - recognizing that the services & benefits provided by medium and large trees will not be offset by tree replacement for many years. Treatment Cost - Costs are dependent on tree diameter, tree condition, location, and number of trees being treated. Treatments may be required every 1-2 years while EAB populations are present. Preservation Amenities - These are site dependent values such as overall aesthetic value, shade provision, noise and wind buffering, visual barriers or other cultural or emotional values. Permanence - Property management and future development plans should be considered in choosing trees for preservation.